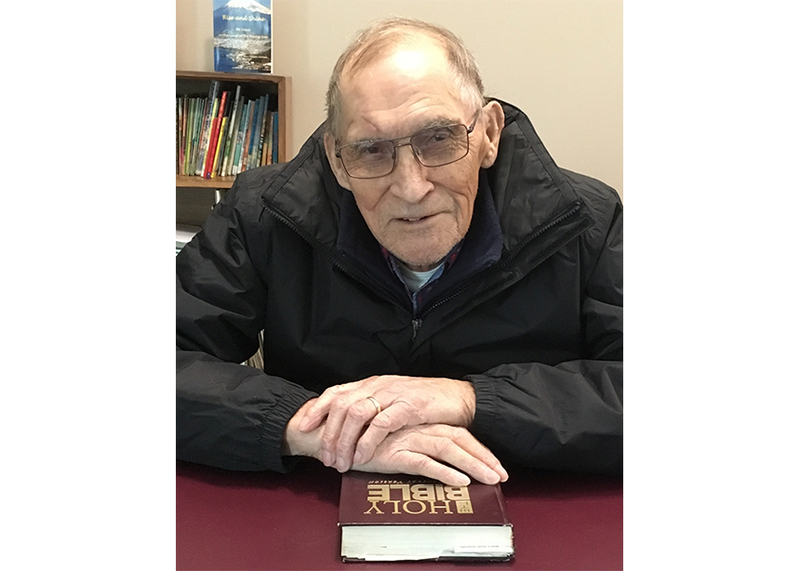 Wes Neepin, a long-time member of Grace Mennonite Church in Prince Albert, has been through some tough times in his 86 years, and God has been there with him. Born in Gillam, Man. (1,065 kilometres north of Winnipeg), Neepin is the oldest of six children. His father died when Neepin was 12. Three sisters attended residential school, but his mother needed him at home. “I had to look after the two young ones while my mother was trying to survive off the land,” he says. At 17, he lied about his age to get a job with Canadian National Railway (CN). Because he was a hard worker, he was promoted to foreman and given charge of 19 kilometres of track, with four or five men reporting to him. He was further promoted to supervisor, but his lack of formal education made it difficult for him to do the job well. After a year, he returned to his former job as a labourer. Neepin married at 21. He and his wife had six children, including twin sons. During his time as foreman, he had to undergo training every two years. In 1976, during a five-day training course in The Pas, Man., he received a late-night phone call from his wife. Their youngest son, also named Wes, had been shot and killed. The younger Wes had a wife and son. A second son was born eight months later. After her husband’s death, the young widow moved with her boys to Swan River, Man. Later, Neepin transferred to Swan River to be near his grandsons. As they grew, he took them fishing or blueberry picking, woodcutting or just out for lunch. “It was the biggest joy at that time for me,” he says. Neepin moved to Regina when he retired from CN in 1989. Some time later, he travelled north to Prince Albert, liked what he saw and decided to move there. He began looking for a church there, and he met Betty at the Salvation Army. The two became friends and eventually married. His search for a church continued until Betty suggested he try “the Mennonite church.” She knew the pastor and said he seemed like a nice man. So Neepin started attending Grace Mennonite Church and became involved in congregational life. He helped with renovations on the church building and eventually served as a trustee. Some years ago, he experienced more grief than many families go through in a lifetime. First, his granddaughter Joanne was severely beaten in Winnipeg; she died of her injuries several days later. Just weeks after her death, Neepin’s son—Joanne’s father—died of a heart attack. A month after that, this son’s twin brother also died of a heart attack. A daughter, Clara, died a short time later. He opens his Bible and points to Jesus’ words in Matthew 25: 34-36. “That’s what I do,” he says.